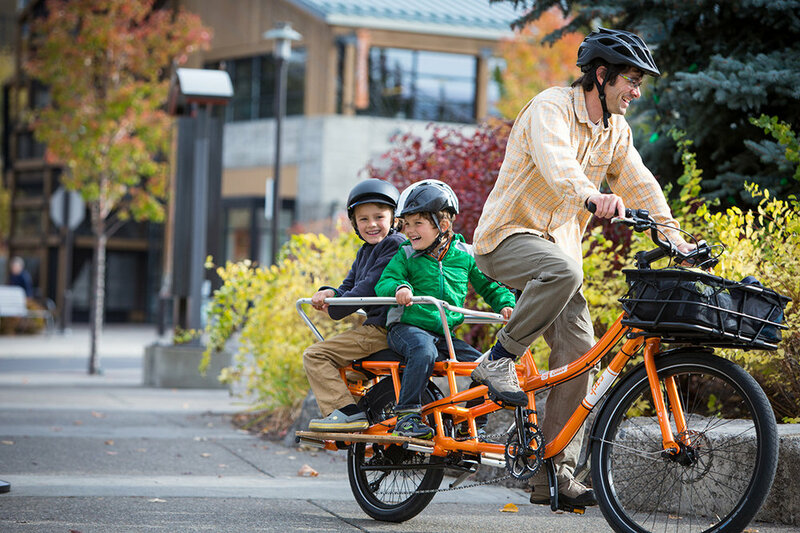 Yuba Cargo bikes from Tall Tree Cycles offer a level of versatility that’s unmatched by most other bikes. From the full-size Yuba Mundo and Yuba Sweet Curry, to the compact Yuba Boda Boda…these bikes haul heavy stuff with a comfy cruiser feel. Ride with kids on board and still have plenty of room for all your stuff. Whether you’re off to the market or just exploring Ottawa or Gatineau, there’s a Yuba for you. Consider an electric Yuba. The Yuba Spicy Curry Bosch and Electric Boda Boda offer state-of-the-art Bosch eBike performance systems for serious climbing and unparalleled range. Parents especially like the extra low rear rack for added stability over their wiggly load. The Supermarché is Yuba’s first Front Loader Cargo Bike. Designed for active parents, small business owners and folks making deliveries, the Supermaché can comfortably and safely haul three or more kids, the family pet, beer kegs or a load of lumber. And yes, it also comes in an electric version. Extra passengers like the Yuba Soft Spot Padded Seat and Hold On Bars or Ring for added comfort and safety. A Yepp Maxi EasyFit child seat or Yuba’s Adjustable Monkey Bars offer a place for idle hands and peace of mind for parents all at once. There are also a variety of Yuba bags and cargo options for you to consider, including the Bread Basket - it’ll hold two cases of beer or two bags of groceries and is rated for 50 pounds of cargo. Call or visit Tall Tree Cycles today to ensure the Yuba Cargo Bike of your dreams is under (or next to) your tree on December 25th.